SODO Another Riders Teased, Oma Zi-O Fully Revealed! Toy Fair wasn’t the only place for exciting new toy reveals this weekend! When Kamen Rider Zi-O first started, a lot of fans have been clamoring for toys based on the Another Rider designs but now it looks like Bandai will be granting us that wish! 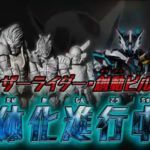 Zi-O Watcher was recently updated with a new Youtube video teaser for the line, and in that teaser, at about the eight-second mark prototypes for the Another Riders were shown. The first four appear to be Another Build, Another Ex-Aid, Another Faiz, and Another Gaim. It’s unclear if these will be released in a box or mixed in future waves of SODO Zi-O. In addition to the Another Riders, Zi-O Watcher released a plethora of new images featuring the Demon King of 2068 himself: Oma Zi-O! Oma Zi-O will be included in Ride7 of SODO Zi-O which will be hitting shelves in March. 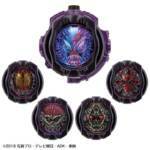 For those of us that have been watching Kamen Rider Zi-O and clamoring for merch based on the Another Riders, we got you covered; P-Bandai just announced a DX Another Rider Ride Watch set. The set will retail for 3,240 yen with pre-orders beginning November 1st, 2018. This set will contain ride watches for Another Build, Another Ex-Aid, Another Fourze, Another Faiz, and finally Another Wizard. There is, however, a catch: all of the sounds will be contained in one Ride Watch block, the actual faceplates don’t appear to unlock any new sounds and are only there for cosmetic purposes only, while the block itself is programmed to cycle through all the sounds. The pre order link is now up! The Another Ride Watch set will be coming out sometime March 2019.